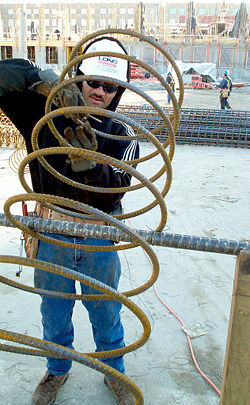 In architecture and civil engineering, construction refers to the act of building, assembling, or renovating large structures—such as homes, office buildings, shopping malls, factories, and power plants—as well as the creation and maintenance of infrastructure such as roads, railroads, dams, tunnels, and bridges. Each project is a feat of multitasking, involving people with many skilled trades. The project normally requires laborers, carpenters, and other tradesmen to perform the physical tasks, and the job is managed by a construction manager, supervised by a project manager, and approved by a design engineer or project architect. To successfully execute a project, effective planning and trained personnel are essential. Those involved with the design and execution of the project must know how to handle such aspects as scheduling, budgeting, site safety codes, and preparation of legal documents. In addition, they must consider such factors as possible inconveniences to the public, environmental impact, and effects of the project on surrounding businesses. Improper planning, untrained labor, or outright fraud can lead to construction delays, cost overruns, material shortages, fire hazards, and structural collapse. Construction on the North Bytown Bridge in Ottawa, Canada. A crane is readied to lower a barge into the water. This barge will be placed under any cutting work on the bridge to lessen the project's environmental impact. Concrete barricades and snow fencing have been put in place to protect workers and the public. In general, there are three types of construction: (1) building, (2) heavy/highway, and (3) industrial. Each type requires a unique team to plan, design, and construct the project. Nonetheless, all construction projects share some elements in common, particularly involving design, financial, and legal considerations. Not infrequently, projects of varying sizes produce undesirable end results, such as cost overruns and structural collapse. The problems, which may lead to litigation, may be based on inadequate planning or the tendency of hired contractors to use insufficient materials to save on costs. To avoid such problems and ensure a positive outcome, professionals with experience in the field must be involved in producing detailed plans and maintaining careful oversight of the project. Many states and jurisdictions have stringent codes for the use of materials, clearances, and egress lanes to maintain fire safety and protect lives. For large or unusual projects, the owner may establish a team of workers and specialists to create an overall plan. This ensures that the project will proceed in an orderly manner toward a desirable end. Although each project has its own needs, the requirements frequently include the work of architects, engineers, mortgage bankers, accountants, lawyers, and insurance brokers. The design, financial, and legal aspects of a project overlap and interrelate. The design of a structure must ensure that it is structurally sound and appropriate for use, and that it is financially possible to build and legal to use. The financial plan must accommodate the need to build the design provided, taking into account amounts that are legally owed. The legal dimension must integrate the design into the surrounding legal framework, taking into consideration the financial consequences of the construction process. Building construction is the process of adding structure to real property. The vast majority of building construction projects involve small renovations to an existing building, such as the addition of a room or renovation of some areas. The property owner often acts as laborer, paymaster, and designer for the entire project. More and more families are looking into building their own homes, or contracting to have them built. Construction practices, technologies, and resources are making home construction significantly easier to accomplish. In practice, a general contractor works closely with the owners to determine their exact needs and desires, and acts as an intermediary between the owner and the subcontractors. Large projects—such as the construction of skyscrapers, shopping malls, or complexes of office buildings—may be undertaken by real estate development firms that may then sell or lease their property to others. The development firm employs or partners with trained personnel who design and construct the buildings. Heavy/Highway construction is the process of adding infrastructure to the environment we build. It includes the construction of roads, railroads, dams, and bridges, along with site grading and massive earthwork projects. Most often, these construction projects are undertaken to serve the public interest and are not profit-making ventures. They are usually owned and executed by government agencies, at the national or local level. There are, however, many instances where such projects are undertaken by large private corporations, including owners of golf courses, harbors, power companies, railroads, and mines. As in other types of construction, the owner needs to assemble a team to create an overall plan to ensure that the project's goals are met. Industrial construction, though a relatively small part of the entire construction industry, is a very important component. Owners of these projects are usually large, for-profit, industrial corporations, including companies involved in power generation and the manufacture of chemicals, commodities, pharmaceuticals, and so forth. The processes used by these industries require highly specialized expertise in planning, design, and construction. As in building and heavy/highway construction, this type of construction requires a team of trained individuals to ensure successful completion of each project. In the modern industrialized world, a construction project usually begins with the work of a design team that plans the physical proceedings and integrates them with other aspects of the project. The team includes specialists such as architects, interior designers, civil engineers, cost engineers (or quantity surveyors), mechanical engineers, electrical engineers, and structural engineers. The team, which is commonly employed by (in contract with) the property owner, prepares drawings and specifications for the project. 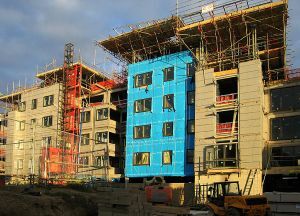 Once the design is completed, a number of construction companies or construction management companies may be asked to offer bids for the work. After evaluating the bids, the owner typically awards a contract to the lowest responsible bidder. The modern trend in design is toward integration of previously separated specialties, especially among large firms. In the past, architects, interior designers, engineers, developers, construction managers, and general contractors were likely to be part of separate companies, even in the case of larger firms. Currently, a company that is nominally called an architecture or construction management firm may employ experts from all related fields, or partner with associated companies that provide each necessary skill. Thus, each such firm may offer itself as "one-stop shopping" for a construction project, from beginning to end. This approach leads to a "design-build" contract, in which the contractor is given a performance specification and must undertake the project from design to construction, while adhering to the performance specifications. The increasing complexity of construction projects creates the need for design professionals trained in all phases of the project's life-cycle. In addition, it helps develop an appreciation of the building as an advanced technological system requiring close integration of many sub-systems and their individual components, including sustainability. Building engineering is an emerging discipline that attempts to meet this new challenge. 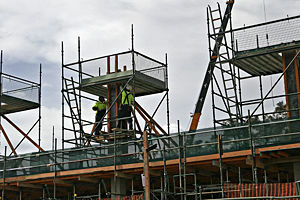 Many construction projects suffer from preventable financial problems. Underbids ask for too little money to complete the project. Cash flow problems are created when the allotted funding cannot cover costs for labor and materials. Given that sufficient funds are needed at specific stages of the project, cash flow problems can arise even when the overall total is enough. Fraud is a problem in many fields, but it is notoriously prevalent in the field of construction. Financial planning for the project is intended to ensure that a solid plan, with adequate safeguards and contingency plans, is in place before the project is started. It is required to ensure that the plan is properly executed over the life of the project. Mortgage bankers, accountants, and cost engineers are likely participants in creating an overall plan for the financial management of the building construction project. The mortgage banker is likely to be involved in even relatively small projects, because the owner's equity in the property is the most obvious source of funding for the building project. Accountants study the expected monetary flow over the life of the project, and they monitor payouts during the process. Cost engineers apply their expertise to relate the work and materials involved to a proper valuation. Large projects can involve highly-complex financial plans. As portions of a project are completed, they may be sold, supplanting one lender or owner for another, while continuing the logistical requirements of having the right trades and materials available for each stage of the project. A construction project must fit into the legal framework governing the property. These include governmental regulations on use of the property and obligations created in the construction process. The project must adhere to zoning and building code requirements. Constructing a project that fails to adhere to codes will not benefit the owner. Some legal requirements come from malum in se considerations, or the desire to prevent things that are indisputably bad—such as bridge collapses or explosions. Other legal requirements are related to malum prohibitum considerations, or things that are a matter of custom or expectation, such as isolating businesses to a business district and residences to a residential district. An attorney may seek changes or exemptions in the law governing the proposed construction site, either by arguing that a rule is inapplicable (the bridge design won't lead to collapse) or that the custom is no longer followed (where live-work spaces have become acceptable in a community). A construction project is a complex net of contracts and other legal obligations, each of which must be carefully considered. Each contract is the exchange of a set of obligations between two or more parties. The time element in construction means that a delay costs money, and in cases of bottlenecks, the delay can be extremely expensive. Thus, contracts must be designed to ensure that each side is capable of performing the obligations set forth. Contracts that set out clear expectations and clear paths to accomplishing those expectations are far more likely to result in the project flowing smoothly, whereas poorly drafted contracts lead to confusion and collapse. Legal advisors at the beginning of a construction project seek to identify ambiguities and other potential sources of trouble in the contract structure, and to present options for preventing problems. During the project, they work to avoid and resolve conflicts that arise. In each case, the lawyer facilitates an exchange of obligations that matches the reality of the project. In many countries (including the United States), public agencies must adhere to legal requirements that contracts for construction projects should be awarded only after a public bidding process. These laws are based on underlying principles that all constructors should have an equal opportunity to engage in construction work for the public, and to prevent the bribing of public officials for contract awards. These laws stipulate rigid procedures for soliciting, receiving, and awarding the contract to the lowest responsive and responsible bidder. In the construction business, the "Authority Having Jurisdiction" (AHJ) is typically the municipality. For a building being contemplated, drawings must be reviewed and accepted by the building department and the fire department's plan reviewers, following the application for a building permit. During the construction of a building, the AHJ representative is the municipal building inspector, who enforces the local building code. In addition, the fire code is enforced by the fire prevention officer, who works for the local fire department. Once construction is completed and the final inspection has been passed, an occupancy permit may be issued. If any changes are to be made to a building—including its use, expansion, structural integrity, and fire protection items—they require acceptance by the AHJ. A fire prevention officer may agree to small changes, but anything affecting basic safety functions, no matter how small they may appear to the novice, may require the owner to apply for a building permit, to ensure proper review of the contemplated changes based on the building code. There are several routes to the different careers within the construction industry. Craft industries offer jobs where employees train while they work through apprenticeships and other training schemes. Technical occupations in England require a general certificate of secondary education) qualifications or vocational equivalents, either initially or through on-the-job apprenticeship training. Graduate roles in the construction industry are filled by people with an degree in subjects such as civil engineering or construction management. Graduates often receive specialized positions and gain qualifications such as chartered status. What is the Culture of Building? by Howard Davis, Agriculture Week. This page was last modified on 13 July 2017, at 19:09.